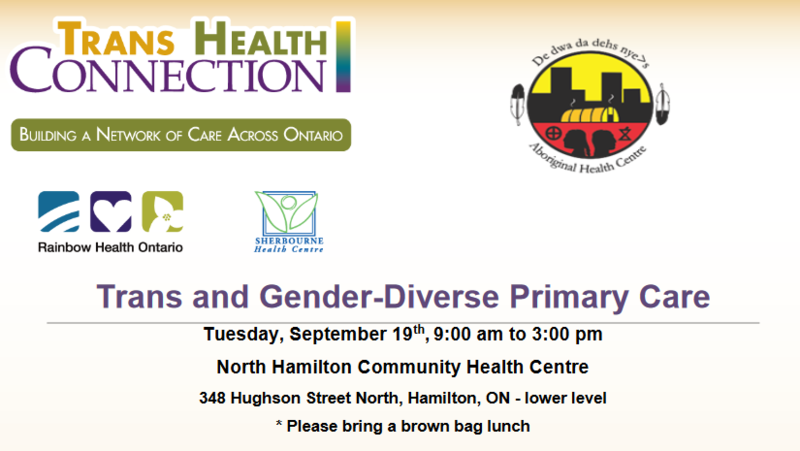 The Aboriginal Health Centre is bringing Rainbow Health Ontario‘s Trans and Gender-Diverse Primary Care program to North Hamilton Community Health Centre on September 19th, 2017. Click here for the event PDF with details. Are you trans and/or non-binary? Are you between the ages of 12-29 and living in Southern Ontario? Want to help improve access to health care for other trans youth in Ontario? Trans and non-binary youth in Southern Ontario are invited to take part in a study about their experiences with access to (or lack of access to) early transition care such as puberty blockers and/or hormones. This study is for youth between the ages of 12 and 29*, including those who have and those who have not tried to use hormones or puberty blockers. The rally location has changed! HTHC will be at the festival continuing Trans Advocacy in Action! Healthcare is a human right! Did you know that there are resources available to help every family doctor develop expertise in trans health care, but that many family doctors are not willing to accept some patients because they’re not confident they have the knowledge necessary? That makes it hard for someone who had questions about gender identity or is in the process of transitioning to find a family doctor. Join the Hamilton Trans Health Coalition for a #100In1Day letter writing campaign. We’ll provide the letter and support with addressing it, and you send that letter to your family doctor to check in with them about whether they are accepting trans patients. Together we can map the family doctors offices in Hamilton offering accessible care and connect doctors who are ready to offer excellent care to all patients with the necessary professional development resources through the Hamilton Trans Health Coalition. We will mail all letters and invite participants who are able to donate $1 toward the cost of postage. Participants who do not have a family doctor may opt to send a letter to their member of provincial parliament in support of access to health care. Please share this event on twitter & spread the word. Explore all the 100In1Day events in Hamilton on June 3rd. There’s time to visit more than one!